For many black British men, barber shops are a place to hang out, chat and meet friends. But for others they waste too much time, which is why two young men have come up with a new approach - a barber shop on wheels that you book via an app. A van painted in bright colours drives slowly down a leafy, residential road in Norwood, south London. A young man in the front garden of a house, clutching a phone, waves at the driver, who parks nearby. They shake hands, then the driver pulls back the sliding door of the van. This reveals a sparkling, silver barber's chair, a large mirror, a hair dryer and pots filled with a variety of scissors. The young man hops in and puts on an apron, syncing his phone to the speakers to get some music playing. The driver - who is now his barber - gets to work with his electric clippers in the tight space. The door is still wide open to let in sunlight. A woman walking her dog along the pavement does a double take, craning her neck back in disbelief. "My service is like Deliveroo, or Uber Eats, but instead of delivering food, we deliver haircuts," explains Darren Tenkorang, 24, co-founder of Trim-It. He currently has two vans buzzing around south London and another in the north-west of the city. Darren is confident he's on to something. "Male grooming is a super-important part of my culture," he says. But in a van? Yes, he says. "My generation really values convenience above all else, you see." Darren grew up in Brixton, south London, where his mother worked as a cleaner and his father as a security guard; they had arrived from Ghana in the 1980s and had dreams of him becoming a banker, lawyer or accountant. University was always part of the plan for him, but when the time came, he wasn't sure which one would feel right. It was a barber shop that helped him decide. "It sounds silly, but the fact that there was an Afro-Caribbean black barber immediately when I got out the railway station at Brighton, to visit the University of Sussex, made me think instantly, 'I could be OK here, I could feel at home,'" Darren says. Afro-Caribbean hair is different from European hair and it takes some expertise to cut it well. Darren found he usually got better results with barbers who specialised in it. "I actually prefer it if a regular hairdresser admits they don't know how to do my hair," he says. "I've had a few bad haircuts when someone is too polite to say 'no', and the results can be terrible." Studying Business Management at Sussex, he got a one-year placement at a re-insurance firm in London - just the kind of thing his parents wanted for him. But while he was there he realised something that made him think hard about his future. He is dyslexic. Initially it was just a hunch, but Darren sought a professional opinion, and the diagnosis was confirmed. When he told his parents, his mother said she'd known since he was at primary school, but hadn't mentioned it. "She thought if I knew it might hold me back," says Darren. Darren reassessed his career plans. "I became worried about all the big numbers that would be flashing around in the corporate world," he says. So he decided to make his own way as an entrepreneur. Immediately he set up his first venture. It was a digital platform that used an algorithm to match clients' personalities with all kinds of tutoring services - it quickly folded. The following year he entered the StartUp Sussex enterprise competition for student entrepreneurs. He decided to work on an idea he was passionate about: male grooming. Afro-Caribbean barber shops are well-known for offering a social, convivial atmosphere - a place to hang out with friends. "My dad used to take me to the barber's in the morning and we'd be there for hours," says Darren. "We'd watch the football, and he would usually sip a pint of Guinness, chilling with his boys." Darren had enjoyed those times. But as he got older he became increasingly frustrated with the slow tempo of the experience. "I got sick of waiting for an hour at the barber, especially on a Friday or Saturday," he says. Or it would be your turn next in the queue, and then the barber would go to eat, or to pick up a child, he remembers. There was a special feeling of community, but perhaps that was more necessary for the generation before his, he wondered. "The new generation, like me, just want a trim and to get on with their day," says Darren. "We live our life fast-paced." And so the idea came to him of an app that would allow you to book an appointment at a salon for a fixed time with a specific barber. He thought this would appeal to everyone, not just those who use Afro-Caribbean barbers. Indeed some apps were already offering a similar service. He included within his proposal an idea that seemed to him slightly far-fetched. He would eventually like to employ barbers directly, who would drive to clients in a van: mobile barber shops on wheels. Darren's Trim-It app won the competition, and he was named the University of Sussex's Student Entrepreneur of the Year. The prize was £10,000. To get his company up and running, he recruited a rival from the competition, a fellow student called Nana Darko, whose confident air had impressed him. Darren promised to make Nana rich. He was similar to him, a young black man from south London with dreams of business success. Together they pounded the streets of Brighton, signing up barbers to their new app - all barbers, not just the Afro-Caribbean ones. Through hard work they built the app to the point where it was getting 2,000 bookings a month. But at the same time, the idea and the fledgling business were unravelling, says Darren. There were constant problems with barbers not turning up on time at the salon. Negative customer feedback was building up. They also hadn't figured out how to make any money from the platform. In 2017, Darren left Brighton and took a full-time job with a multinational company that specialises in sports betting, while trying to keep Trim-It going in his spare time. The competition money had dried up and the app seemed ready to die a natural death in the app store. "Self-doubt and a bruised ego had become something I was used to dealing with," he admits. Nana too was feeling bitterly disappointed. He had graduated with a first in engineering. But he was missing out at dozens of job interviews in the corporate world and he couldn't figure out why. Was it the way he presented himself, the way he talked, or perhaps the colour of his skin? It was at this low point that Darren and Nana decided to take a risk. They would focus on the side of the business that had at first seemed so implausible and try the idea of mobile barber vans - only this would allow them to control the whole customer experience. Through family and friends they were able to raise a five-figure sum in a last-ditch attempt to jump-start the business and in February 2018 the first van was ready - a Ford transit Darren customised outside his parents' house. The back of the van was all stripped out, to turn it into a mini-barber shop, powered by an electric generator. They recruited two full-time barbers, updated the app and waited for the bookings to come in. Very quickly those bookings arrived. In fact by July 2018 the van was permanently fully booked. You can book your next haircut at any time and any place by simply clicking on an app. Word spread partly due to some celebrity customers such as musicians Charlie Sloth and Sneakbo, who both have hundreds of thousands of followers on Instagram and Twitter. As Darren and Nana had intended, the kind of people making the bookings were mostly young, black millennials - people like Lewis, from West Norwood. "If I was 15 or 16, then I'd go to a barbershop," says Lewis. "But I'm 23, managing properties and working part-time, so I don't have time to go to a salon and wait for my turn." He might miss some of the banter in a typical Afro-Caribbean salon, but if he feels like company he can invite friends into the back of the van where there is a small bench for them to sit on, he says. Buoyed by the early interest, Darren was able to sign up more investors, allowing the team to raise a six-figure sum. Around the same time it was becoming clear that there was a shortage of barbers catering to Afro-Caribbean people in parts of London with large numbers of well-paid workers. "We're finding that because there is a bigger black middle class and there's more people working in the City, that we have pockets of customers there," Darren says. 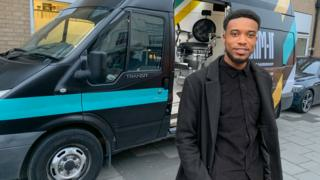 The van also turned out to be attractive to a new generation of black middle-class professionals looking for a haircut while working in trendy areas such as Old Street, Bethnal Green and Shoreditch. In the first year, about half of the van's business came in this way, says Darren. As of this week, there are three vans in operation. The increasing number of black professionals may mean that the relatively high cost of a Trim-It cut - £25 - is not an obstacle to growth. But there are others. One obvious problem is parking. When visiting residential areas, customers often provide tips on where to park, to avoid getting a ticket. It can be easier in the evenings, when parking is free of charge. But to cut hair in working hours in central London, the team has to find a place where they can park for a short period free of charge - no mean feat - or pay for a spot. The difficulty of reaching customers in different parts of the city, bearing in mind London's traffic problems, is expected to reduce if and when more vans come on stream, each serving a smaller area. But there is also the problem of climate change - will young clients continue to feel comfortable having their hair cut in a van that runs on fossil fuels. And of course many people in the black community still feel a strong emotional attachment to the barber shop, which was such an important meeting place for first generation immigrants. Lawrence Agyemang works at a barber shop in Oval, south London, where Darren had his hair cut as a teenager. "Young guys still want to hang out here in front of the shop, to show off their new hair styles," he says. And older people come even when they don't really need a haircut, he says, to socialise, watch sport, or just share a joke. Darren says that if his parents, 20 years ago, had thought their son would go into the barber shop business, they would have been "horrified". But if he can overhaul the barbering business, he thinks he might just make them proud. "Mobile barbershops will be a thing, trust me," he says. Gina Atinuke Knight's white mum loved her, but her childhood in a white family meant it took her years to embrace her blackness. Her hair was one of the first things she came to love, which is why she became a hair blogger and wig-maker. Join the conversation - find us on Facebook, Instagram, YouTube and Twitter.